Brazil is a large country, somewhat greater in area than Australia. Until I consulted the atlas I had not realised that it even extends into the northern hemisphere. Its southernmost point lies on the same latitude as Newcastle (NSW), while the northernmost point corresponds in latitude with Mount Kinabalu on the island of Borneo. Its climate varies from temperate or subtropical in the south to tropical in the north. Although the country is largely hilly or mountainous, its highest peak is only 3014 m, a midget compared with many of the giants in the Andes mountains that extend through Brazil’s neighbours to the west. The Amazon River is undoubtedly the most well known of the country’s many geographical features. The world’s largest river, it is navigable by cruise liners as far upstream as Manaus, over 1000 Km from the sea as the macaw flies and probably several times that distance as the piranha swims. The Amazon is not a single river, as it has hundreds of tributaries, eleven of them each over 1000 Km long! The basin drained by the Amazon River system is larger in area than the state of Queensland! This basin consists primarily of dense rain forest, its canopy so thick that little vegetation grows on the forest floor. Most plants, birds and animals live in the canopy. Its orchids are therefore not easily accessible, although some in the lower canopy may apparently be seen from boats when the river and its tributaries are in flood. 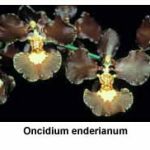 Orchids found in the Amazon rain forest include Cattleya eldorado,Cattleya violacea, Oncidium lanceanum, Oncidium cebolleta and many brassias, catasetums, encyclias and epidendrums. These are primarily warm growers, because the temperature in the Amazon basin during the warmer months averages 28˚C. In the cooler months the temperature still averages 25˚C! The other large area of rain forest in Brazil lies in the south, in a band stretching several hundred kilometres inland from the coast. Unlike the east coast of Australia, where there is a substantial coastal plain between the mountains and the sea, Brazil has little or no coastal plain. There are four mountain ranges in this region, the most well known to orchid growers being the Organ Mountains (Serra dos Orgãos). 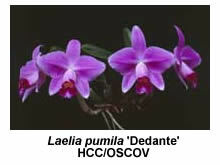 About 80% of Brazil’s orchids, amounting to over 2000 species, are found in this area of sub-tropical forest. The climate in these mountains is relatively mild with warm, wet summers and cooler, dry winters. All of the orchids found here can be grown under intermediate glasshouse conditions and some can also be grown in a ‘cosy’ shade-house in Melbourne. 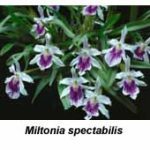 Orchids found in the Organ Mountains or in adjacent mountain ranges include many cattleya species, all the known sophronitis species and many oncidiums, promenaeas, maxillarias and miltonias. Apparently many species can be found growing in national parks only a short distance inland from Rio de Janeiro. 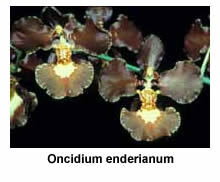 Orchids from this region that I grow ‘cold’ include Oncidium enderianum, Miltonia spectabilis, Laelia pumila (syn. Sophronitis pumila) and Maxillaria porphyrostele. 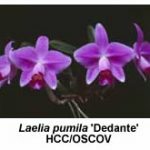 Another orchid habitat in Brazil is the campo cerrado or woodland savannah found on an extensive plateau (altitude 1000 m) that extends inland from the above rain forest towards the capital city, Brasilia. 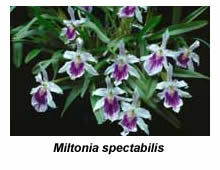 Many rupiculous (rock-loving) laelias (recently re-assigned to the genus Sophronitis) are found on rocky hilltops in this area. These orchids often grow in full sunshine, where they bake during the day and then recover under the influence of mists and fog at night. Not surprisingly, because of their specialised requirements, these rupiculous laelias are more difficult to grow than those laelia species found in Mexico or elsewhere in Brazil.